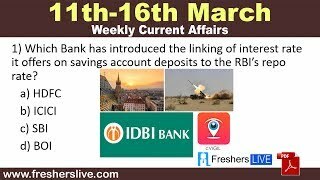 Current Affairs 16th March 2019: Instantly obtain Latest Current Affairs 16th March 2019 with all essential info, Be the first to know all the Current affairs 16th March 2019 top news, Major Issues, Current happenings, Important events in National as well as International level with clear explanation. For all competitive exams and Interviews, equip yourself with the Latest Current Affairs 16th March 2019 granted here. Geographical Indication (GI) tags have been granted to Coorg Arabica Coffee, Wayanad Robusta Coffee, Chikmagalur Arabica Coffee, Araku Valley Arabica Coffee and Bababudangiris Arabica Coffee, by the Geographical Indications Registry on 1st March 2019. Coorg Arabica Coffee is grown in Kodagu, Karnataka. Wayanad Robusta Coffee is grown in Wayanad, Kerala. Chikmagalur Arabica Coffee and Bababudangiris Arabica Coffee are grown in Chikmagalur, Karnataka.